It's hard to believe it's been more than a year since I've been here. Bodyweight workout at least twice a week. Particularly, I want to focus on improving my overhead pulling and pushing. These are areas where I'm pretty weak. Pull-ups and shoulder presses/wall walks will be a part of my workouts. Do my three-mile walk at least once a week. This should be simple. I have a three-mile route that I can walk to work, or I can take a loop around my neighborhood. Poor weather and short days may limit the frequency of this walk, so I only put once a week. For Christmas, I bought myself a GoRuck pack. I may get a ruck plate as well so I can carry weight easily. I want to incorporate this into my hiking. Intermittent Fasting (calorie input between 11:00 and 19:00) six days a week. (Saturday breakfast may be permitted!) I've been doing IF on occasional days over the last month or so, and my weight has moved from hovering around 190 to hovering around 180. I know the scale isn't the best tool to measure, but I do feel better, too. I'll drink tea and water when I wake up. For l lunch, I'll pack stuff like salad, fruit, nuts, veggies, boiled egg, green smoothie, etc. Good dinners with veg and protein. Limit breads and empty sugars. Read one book during the challenge. I've set up a Goodreads reading challenge this year of 15 books. I want to start and finish one book during this challenge. I bought a Standard Memorandum book this year. I've seen old notebooks like this at my mother's house, and I think it's a great way to document a year simply. There's only room to write a couple sentences, so it's easy to write an entry each day. and knock em out at the same time. Also, welcome back! I just came back after a break 6ms break with a half-finished 4WC in between. Has it really been a year you have been gone?! Thanks man! Yeah, I checked on my last post, and it was more than a year ago! Not cool. Yay, new goals!! Welcome back into the fray. 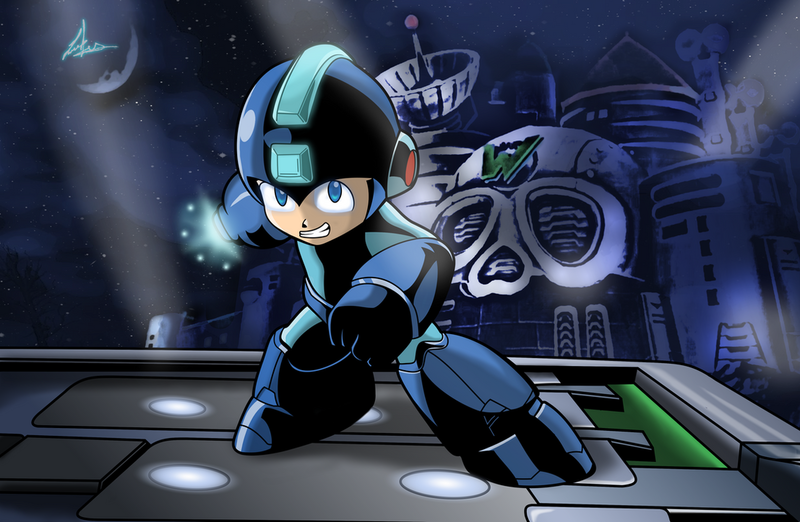 Really digging the MegaMan theme. I look forward to hearing more about your challenges. I'm in a very similar boat as you; returning after more than a year and a half and trying IF as well. Super jealous of the GoRuck pack. I've been coveting one of those for years. Let us know if you come across any good reads! Thanks! Glad to be back. Got in BW workouts with pull-ups on New Year's Day and yesterday. Maybe it's a placebo effect, but I feel better when I don't have breakfast in the morning. Maybe I'm just feel better because I'm doing better and eating better? Who knows. Regardless, I feel better, and that's the good thing. Today I was out of the office and away from my lunch, so I ended up 19 hours from dinner last night till lunch today! Intermittent Fasting! It was good though. When I got home, I played around for about 10 minutes of QM and had some salad and chili, along with some plain yogurt with homemade applesauce in it. Yum. I've put a lot more vegetables in my latest chili recipes. I used bison meat, left out the beans, and added zucchini, sweet potatoes, red pepper, and corn this time around. Any other good chili vegetable suggestions? Maybe sweat in some onions with the meat (so they are cooked down) but other than that, I applaud your veggie choices . You could also replace sweet potato with butternut squash. Waving excitedly, hey welcome back, missed you! That chili sounds great. I know people are a fan of pumpkin/butternut squash. Mushrooms could also be good. I love fennel in stews/soups but it would probably make it decidedly less like chili if you were to include it. Any other good chili vegetable suggestions? GET OUT! I'M SO EXCITED! One week down. How'd we do? Success. I did two bodyweight workouts last week. Practiced my pull-ups, did some divebomber pushups to help with my overhead pressing. Success. I did my three-mile route on New Year's Day and again yesterday. Success I ate in the window between 1100 and 1900 every day except Saturday, which was also the day I ate bread (toast for breakfast). I'm enjoying eating more vegetables and trying out new recipes. I also started Desert Solitaire over the weekend, and I'm about 31 percent through it. Enjoy new pack day! Which one did you get? I got the GoRuck GR1, the standard model. I think I'll get a plate later this month. Really having fun with QM and floor moves this week. Maybe digging more into this in the future! I did the GMB Elements Program, which is the monkey, frogger and bear combo. I really loved it. Yeah, agreed! Animal Flow, like Global Bodyweight Training's stuff? That's what I learned, but I got their DVD quite a while ago. I'm not doing a program, but playing around with their stuff. Yeah, I think so. I'm not doing a program either but for now and playing around with their animals (ape, beast, crab) and the transitions between them. At some point soon I will start including some of the other QMs out there like bear, lizard, frog, etc.